Home Tags Posts tagged with "Unbreakable Joy"
Khloe Kardashian and Lamar Odom are releasing their second scent just in time for the holiday season. In the same way music artists monetize on the time of year for giving, Khloe Kardashian and Lamar Odom are hoping to increase their earnings with a follow-up perfume titled, Unbreakable Joy. Playing on the first cologne called Unbreakable, the name simply screams Christmas. When last year’s bottle hit the shelves they stated it was all their strong bond. In a new statement, Khloe Kardashian, 28, describes how they channeled the most wonderful time of the year. “The holiday season is all about surrounding yourself with the ones you adore, and we wanted to create a fragrance that really captures that overpowering joy you feel during this wonderful time,” Khloé Kardashian said. The pair picked notes of fresh spices, champagne, jasmine, chocolate truffle, cedar wood and musk, which are apparently, the ingredients this charismatic couple surrounds themselves with during the holidays,’ according to a release. In the advert, Khloe Kardashian can be seen wrapping her arms around her husband’s neck as she grins. Her flowing brunette locks which cover one eye fall onto his bald head as they both look down the camera lens. While the photograph is black and white the product stands out as it is allowed to be seen in its red glass bottle form. The scent – which retails for $45 – features silver foil bubbles that represent champagne and the festive spirit of the season. 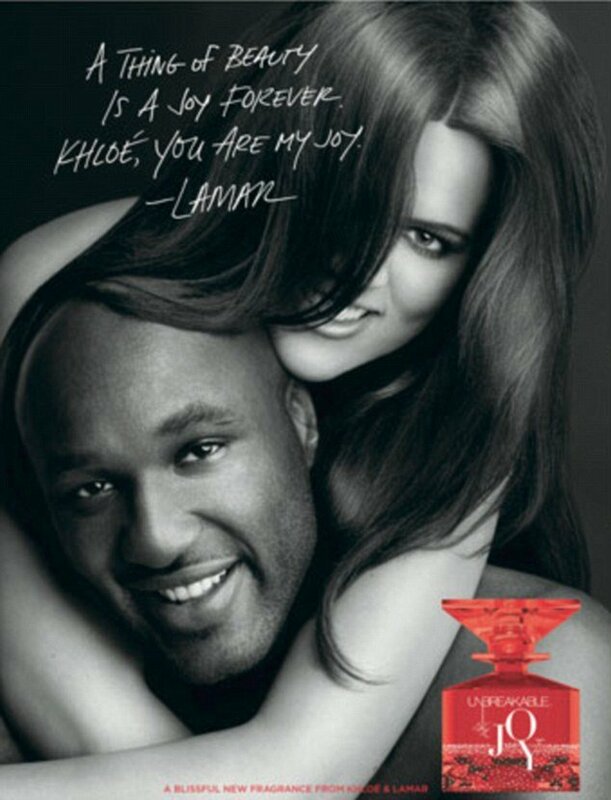 At the bottom of the shot, it is introduced as “A blissful new fragrance from Khloe & Lamar”. Khloe Kardashian has wasted no time in promoting it and has already made the print her Twitter background. In her blog she wrote: “Lamar and I are beyond thrilled to announce the release of our second fragrance – Unbreakable Joy!!!! It’s out just for the holiday season, and our goal was to create a scent that embodies that wonderful feeling of pure love, happiness and joy that this time of year is all about. “We poured our hearts into the creation of this fragrance and we’re so happy with how it turned out – we hope you are too!